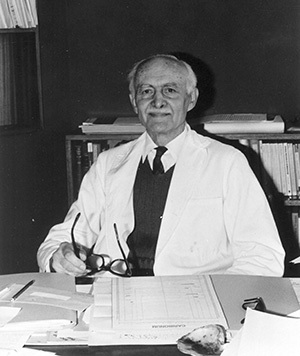 William John Talbot (1908 – 1985) was responsible for establishing the Talbot Map Collection at the University of Cape Town. Born and raised on the Isle of Wight, he studied geography and geology at University College, London, and Berkeley, and taught at the University of Glasgow. He immigrated to South Africa in 1936, following the establishment of a professorship in geography at the University of Cape Town, where his teaching and research would be focused on ‘human-environment relations’. He was dedicated to understanding the complex set of relationships between people and their environment, how the ‘natural’ and the ‘cultural’ are integrated and expressed in the landscape, particularly in agricultural landscapes. Talbot devoted most of his working life to building up a productive Department of Geography at UCT. Key to this was the map collection he compiled in the pre-war years, drawing on the map-making and interpretation skills he’d honed in Glasgow under the mentorship of Alexander Stevens, who had distinguished himself as geologist and chief of the scientific staff on the Shackleton Antarctic Expedition from 1914–1917. During World War II, Talbot’s map collection was commandeered by the army corps as ‘the most comprehensive collection of African and European topographic survey maps in the country’ (Talbot 1973). When, years later, they were returned to the department they were accompanied by a letter of appreciation by the director of the Trigonometrical Society extolling their virtues as the ‘only maps of French North Africa available to the South African forces after the fall of France’ (Talbot 1973, vii). The collection was returned ‘with interest’ in the form of a large number of army surplus maps and a set of 1938 aerial photographs. In the late 1940s, Talbot got the idea to put together a comprehensive national atlas and later began working on this project with his wife, Anna-Marie (in collaboration with the two cartographers, Ken Behr and Andy Vinnecombe, who were employed at UCT). His magnum opus, the monumental Atlas of the Union of South Africa, was published by the Government Printer in 1960. It is an enormous work (physically and conceptually) that contains almost 600 hand-drawn black-and-white maps and as many accompanying graphs and other diagrams. This text is drawn from the biography of Talbot by Michael E. Meadows, Head of the Department of Environmental and Geographical Science at the University of Cape Town, published by Bloomsbury Academic in Geographers: Bibliographical Studies, Volume 23, 2013.